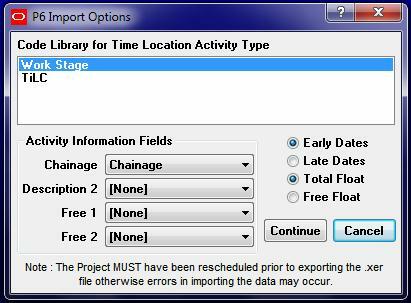 Time Location Plus is capable of importing data from Primavera P6 and earlier Primavera versions, in all versions that create .xer or .xml files (versions P3e, P4, P5, P6, P6 v7, P6 r8) Time Location Plus will also import from programs that create .xer files (e.g. Primavera Contractor, Pert Master and Primavera Risk Analysis). The import procedures are the same for all versions. Unless specifically stated all the following applies to all versions of Primavera P6. In order to import data from Primavera P6 it is necessary within P6 to allocate chainages to the tasks and to set up a code base for the different types of tasks. The project must then be exported in Primavera XER format. Time Location Plus then extracts the relevant data from the XER file. Any Global or Project UDF can be used but it must be the same field for all activities and it must not be used for any other purpose. A specific activity code (or series of codes) for use with Time Location Plus must be set up, with values for the different types of Activity. This will form the basis of the Key Legend for the time location chart. All Activities which are to be imported into the time location chart MUST be allocated a time location package code. Tasks which do not have an allocated code will not be imported. 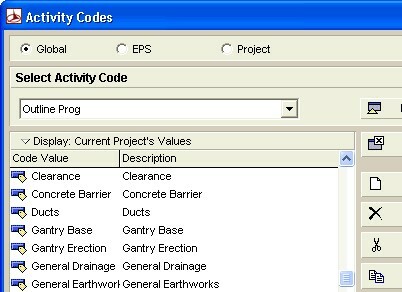 In the above example an activity code Outline Prog has been set up with values for Clearance, Concrete Barrier, Ducts etc. The project MUST be rescheduled prior to export otherwise Primavera does not include in the exported file, all the information required by Time Location Plus, resulting in errors and omissions in the imported data. Locate the .xer, .xml or .zip file and the P6 Import Options dialogue box will open. Highlight the Code Library holding the information on the Time Location Types, and select the Activity UDF holding the chainage information, from the dropdown chainage box. Select to Import Early Dates or Late Dates and select to use Free or Total Float. Description 2, Free 1 and Free 2 list optional information that can be imported for display on the chart. This includes all activity UDF's and WBS. Select the desired selections. Note: It is possible for the same name to appear in the chainage drop down box more than once, if the same name has been used in the project for different udf's. If there is more than one entry with the same name ensure the correct one is chosen for import (which may take trial and error). The data will then be imported and the Save P6 Settings button will appear in the toolbar.